I fell down the rabbit hole of the Internet a few weeks ago, while catching up with A Bright Wall In A Dark Room, a brilliant film blog. I was reading Bebe Ballroom’s essay on Miranda July’s Me and You and Everyone We Know, easily one of my favorite films of the past decade or so, and was struck by the image of the film’s title screen – John Hawkes on the grass, frantically waving his hand around after he lights it on fire. The scene has always struck me, but something about the title text over it; I don’t think I had ever noticed it while watching the movie. I was always focused on John Hawkes’ flaming hand. So I took to Google Image Search, looking for a large capture for my computer desktop. 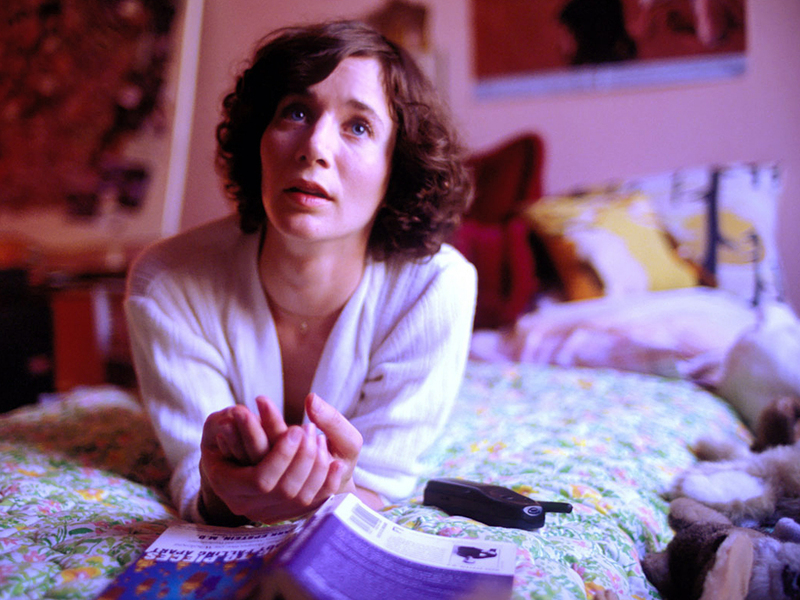 I got caught up looking at stills from the movie, and started thinking about how Miranda July and I have had a lot of similar haircuts, and maybe my next haircut could be like one of hers. Then I noticed in the still above she’s reading a book that I’ve been reading, Mark Epstein’s Going To Pieces Without Falling Apart. My mom has a tendency to send me books relating to major problems or changes in my life. When I got a job at a family portrait studio, she sent me the Awkward Family Photos book. When she sent me Going To Pieces Without Falling Apart, I was dealing with the shitstorm trifecta of a sad break-up, the end of a job I had liked, and a bad roommate, all at once. Going To Pieces Without Falling Apart is about the intersection of Meditation and Psychotherapy, which is interesting because we might think of them as opposites – meditation as quieting the mind, therapy as encouraging its musings at their most unfiltered. But ultimately, they both strive to understand it, and where that overlap occurs is what Epstein explores. This story has stuck with me, because it reminds me of when I sat with Marina Abramovic during her exhibit, The Artist is Present. I went to MoMA mostly to see the Bresson exhibit. I was interested in seeing Marina Abramovic, but I wasn’t entirely sold on waiting in line to sit with her. But what happens to me when I’m put into a competitive environment is that I end up wanting to compete. (Ask anyone who has ever watched sports with me, or a sports-related movie or TV show, or even some non-sports related movies or TV shows.) So when my friend and I got to MoMA and the final line-up hadn’t even started, I switched into warrior mode. We became part of a big pool of people who were bumrushing the stairs for the chance. Someone pinned me to the wall with their elbow, but I squeezed out from their force and managed to be towards the front. I was two people ahead of Paco Blancas, the make-up artist who I knew had sat with her many times, so I felt like my chances were good. I found myself in line behind my former creative writing professor. I had good memories of that class, though I felt bad that she was teaching at a school that had so many bros (when Dave Matthews was doing a big show in the city one night, a good fifth of the class was absent). She did some very “stereotypical creative writing professor” things. She had long, unkempt hair, wore a lot of black, had a seemingly endless array of long skirts, and I remembered noting that she didn’t shave her legs or armpits. One day she held class outside and told us to write about what we saw. Another day she gave out pieces of chalk and told us to write our words around the school. I wrote a poem about my big college love affair on the side of a water fountain. Still, I was sad to see she had begun to take herself way too seriously. She mentioned she was studying at Columbia and seemed severely unimpressed that I wasn’t getting my Master’s. 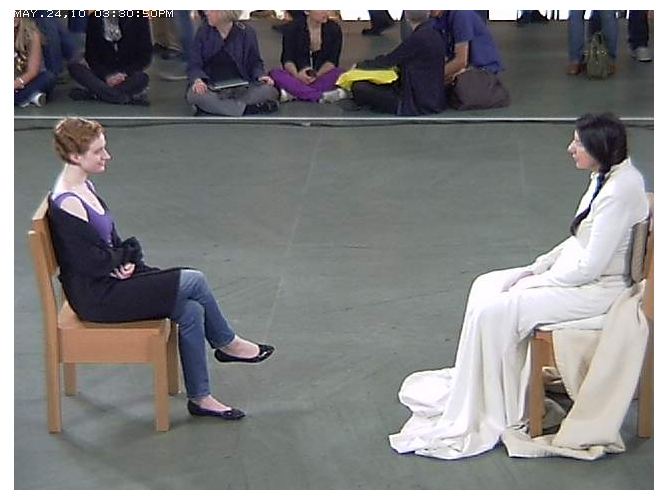 She sat with Abramovic for a long while and looked rather possessed. I hadn’t understood all the pictures of people crying until I sat down. It was so overwhelming, being under all of the lights, under all of those pairs of eyes watching, thinking about all the things people had done, simply to be in the same room with her. It took every ounce of restraint I had to avoid bursting into tears. I composed myself and remembered I originally planned to smile. I felt like it might be a nice change from all the people with straight faces. I started thinking about how Abramovic is a strong woman, and about all the strong women in my life, from the women that raised me, to those who had inspired me, like Patti Smith and Virginia Woolf. I started thinking about all the ways I wanted to be strong, about getting past that string of bad break-ups and bad jobs. I thought about the cross-country journey I was about to leave on, and about the other projects I had wanted to start for so long. I started thinking about my friends who inspired and encouraged me, and all of the positives forces in my life. I got lost in these thoughts for a while, and then something happened – my mind went blank. I could feel myself starting to cry again, and I got up and left immediately. Later, I wished I had stayed, wished I had pushed past that instinct to run away from a quieted mind, and to hide or stop the tears. Like Marina Abramovic, Miranda July’s work often explores the variety of boundaries we enforce and are accustomed to, and how people react when they are broken. That struggle with awkwardness and discomfort we can experience when connecting with someone, particularly with someone new, is at the heart of Me and You and Everyone We Know. Like the characters in the film, like Epstein’s experience with Ram Dass, I found it hard to relax those boundaries, even in the face of Marina Abramovic – but in that brief moment when I could, I found an intensity that has reverberated in my mind for a long time. can I just click LIKE on this instead of formulating a proper comment response? I don’t know about Mark Epstein and Marina Abramovic really… but I <3 me some Miranda July and TKL. this a good read.